Close to the base of Arenal Volcano, the Tabacón Resort & Spa provides you a relaxing and unparalleled experience with its natural hot spring and thermo mineral water pools, its tropical and exuberant surroundings and its famous Iskandria Spa. 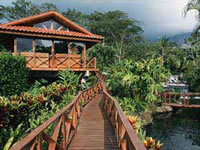 The Tabacon Hot Springs Resort & Spa is a luxurious hotel in an extraordinary setting. Combined with exceptional service, warm smiles and outstanding facilities, it assures their guests an unforgettable time in Costa Rica. The resorts attentive staff awaits you in two restaurants, serving international and traditional Costa Rican cuisine. The Tabacon Resort offers 95 spacious standard rooms and 11 Jr. Suites, all with furnishings handcrafted by local artisans. All guest rooms features a private balcony or terrace overlooking the resorts impeccably landscaped tropical gardens. In-room amenities include air-conditioning, cable TV, hair dryer, safety box, coffeemaker and Room Service. Offering exceptional views for relaxation and romantic moments, the Jr. Suite features a cozy Jacuzzi on a private balcony or patio. Other amenities include a fully stocked mini-bar and luxury cotton bathrobes. Guests of the hotel enjoy unlimited access to the Tabacon Hot Springs during their stay.